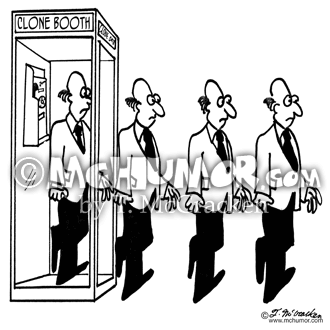 Cloning Cartoon 2732: Four identical men walk out of a "Clone Booth." 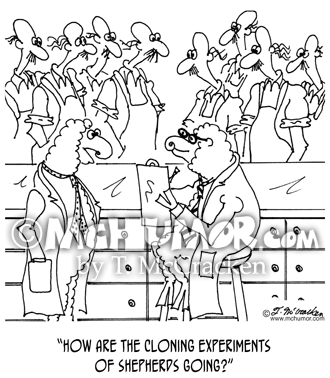 Cloning Cartoon 6778: Looking at identical farmers, a sheep in a lab coat says to another, "How are the cloning experiments of shepherds going?" 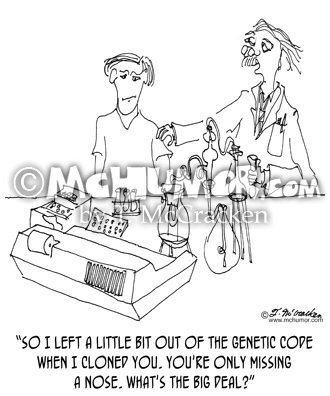 Cloning Cartoon 0914: A scientist in a lab says to a boy without a nose says, "So I left a little bit out of the genetic code when I cloned you. You're only missing a nose. What's the big deal?" Clone Cartoon 5995: "The Clone Ranger." 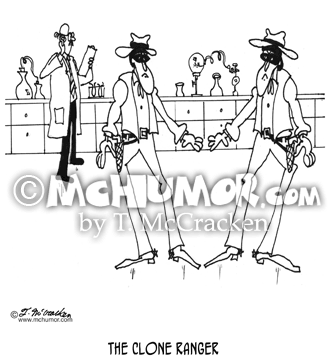 In a lab there an two duplicate Lone Rangers. 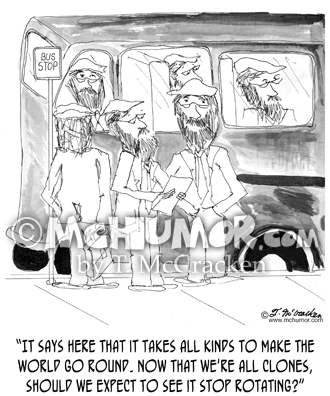 Clone Cartoon 0043: A man reading says to an identical man, "It says here that it takes all kinds to make the world go round. Now that we're all clones, should we expect to see it stop rotating?" Baby Cartoon 0985: "In the Year 2500." 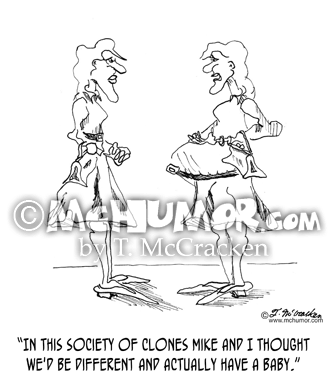 A pregnant woman says, "In this society of clones Mike and I thought we'd be different and actually have a baby." 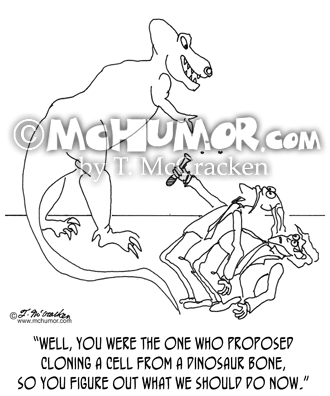 Clone Cartoon 0605: Of a dinosaur about to attack a scientist says to another, “Well, you were the one who proposed cloning a cell from a dinosaur bone, so you figure out what we should do now." 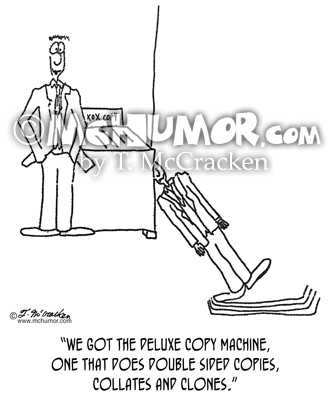 Cloning Cartoon 0941: A man standing in front of a copy machine where his clone is coming out of it, "We got the deluxe copy machine, one that does double sided copies, collates and clones." 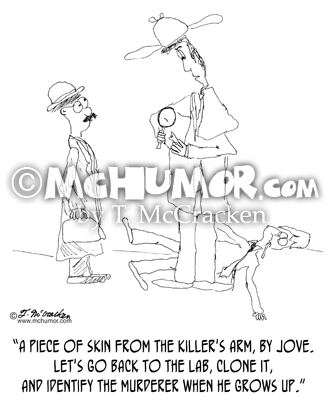 Cloning Cartoon 0008: In front of a murdered man Sherlock Holmes says to Watson, "A piece of skin from the killer's arm, by Jove. 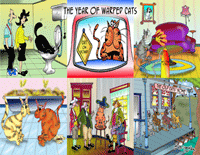 Let's go back to the lab, clone it, and identify the murderer when he grows up."